Saudi Crown Prince Mohammad bin Salman and his entourage are likely the reason one of Silicon Valley’s highest-tier hotels is closed to the public this week, Recode reported, as the prince continues to make the rounds in a marathon spree of meetings with some of the United States’ most powerful people. A press rep for the State Department and the spokesperson for the Saudi Arabian Embassy did not respond to requests for comment when asked if the Saudi Crown Prince and his entourage were staying at the hotel. Four Seasons PR rep Malia O’Connor said the hotel wouldn’t disclose the names of individual guests. The Saudi delegation effectively closed down the Plaza Hotel in New York this week, where they signed a memorandum of understanding with SoftBank to invest up to $200 billion in solar power development in the Crown Prince’s kingdom. The delegation was so big that they reportedly had to book additional rooms at the Four Seasons and St. Regis to host the group in its entirety. Really though, it’s hard to imagine some other VIP with stringent security needs and the free cash to lock down a hotel for a week just happens to be coming by. Bin Salman has sold himself as a liberal reformer who wants to set Saudi Arabia on a path to become a major international tech hub, including by building a $500 billion semi-autonomous city of the future called Neom in the country’s northwest which will supposedly have more robots than people. This all sounds well and good, but there’s a long tradition of the royal family praising themselves as reformers in the public eye while simultaneously committing human rights violations and overseeing a culture of awful labor abuses. Though there has been some progress towards reform in recent decades, it’s been tenuous at best, and bin Salman himself allegedly consolidated his power in a crackdown on other rivals in the ruling clique rife with allegations of torture. Someone even paid for a fawning, 97-page magazine titled The New Kingdom to appear on 100,000 newsstands ahead of his US visit, Middle East Eye reported, full of articles without bylines that failed to mention things like the Saudi-led war in Yemen or how bin Salman allegedly kidnapped Lebanese prime minister Saad Hariri and forced him to resign. 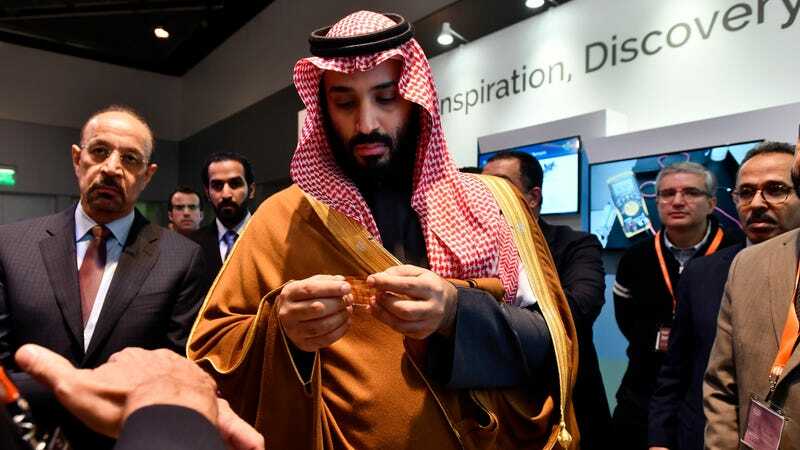 There’s ample evidence elsewhere that the crown prince has chosen a Silicon Valley-style image as a way to sell himself in the US, which in addition to easing any PR troubles could possibly help him connect with opportunities to diversify the Saudi economy. The CEO of a $500 million technology venture fund backed by Saudi Telecom, Abdulrahman I. Tarabzouni, wrote an op-ed in CNBC in late March arguing bin Salman would “disrupt” the complacency of an oil-based economy and address the “increasingly connected, digital lives” of the nation’s youth.